The Halloween candy has arrived and it’s taking every ounce of willpower I have to avoid the trick-or-treat bowl as much as possible. The obvious response, of course, is to make your own candy. Right? Thought so. I’ve always been a Heath Bar lover. That’s what I always get on ice cream, and Heath Bars were one of my favorite treats in my Halloween basket as a kid. I’ve been putting off making my own because candy-making is intimidating. You have to have patience and a candy thermometer, and I never seem to have both at the same time. But when I dreamed up a pumpkin spice toffee, I knew I needed to make it happen. 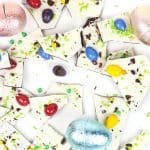 After trying a couple different ways, I landed on this Dark Chocolate Pumpkin Seed Toffee Bark recipe. 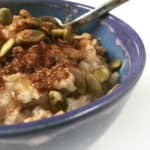 Let me tell you: It has toffee, it has pumpkin spice, it has roasted pumpkin seeds. It even has sesame seeds, dark chocolate and sea salt. Everyone knows this is what fall tastes like. Once you have your candy base, you can stir in vanilla and pumpkin pie spice. Spread it over roasted pumpkin seeds, and sprinkle more on top. Also add sesame seeds, dust with sea salt and drizzle on dark chocolate. Pop it in the fridge for a bit, and you’ve got a a glorious tray of hardened pumpkin seed toffee candy. 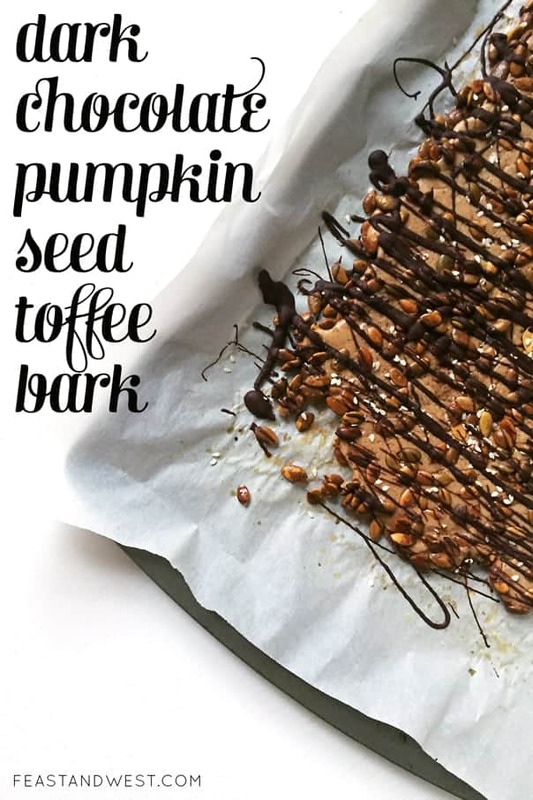 Click through for the Dark Chocolate Pumpkin Seed Toffee Bark recipe! Preheat oven to 350° F. Line a large baking sheet with parchment paper or a silicone mat. Spread pumpkin seeds on baking sheet. Bake for 10-12 minutes, stirring halfway through, until lightly browned. Set aside. Once cooled, reserve 1/4 of the the pumpkin seeds. Clip a candy thermometer, if using, to a large sauce pan, about 1/2″ away from the bottom of the pan. Grease lightly with cooking spray. In a large saucepan, combine butter, sugar and salt. Bring to a boil over medium heat, whisking often. Reduce heat if necessary. Cook approximately 12-15 minutes or until the mixture is golden. (If using a candy thermometer, remove from heat when the mixture is 300° F.
Stir in the vanilla and pumpkin pie spice until well blended. Pour and spread over nuts. Let cool 2-3 minutes. Sprinkle on remaining pumpkin seeds, sesame seeds and sea salt. Drizzle with melted dark chocolate. Refrigerate until set. Break into pieces and store in an airtight container. And OMG you guys. 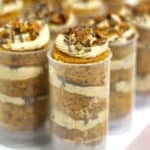 These pumpkin recipes! Get after them. Huge ups to Sara at Cake Over Steak for coordinating this fun blog get-together. Mmm love the way this sounds!! So tasty! Love this!! Looks so good! Happy pumpkin day! HEATH BAR! Why have I not thought of this in like a year! Heath bar crunch ice cream was all I ate in college (well, all I wanted to eat anyway). This pumpkin toffee bark looks amazing and I agree that it is the perfect solution to not eating Halloween candy (It’s one of those solutions that you shouldn’t think too hard about and just go with it…haha). I’m busy working my way though all of the amazing pumpkin recipes. Everyone did such an amazing job from savory, to sweet, to the amazing drinks. I’m happy Sara brought us all together! Nice to meet you and your beautiful blog. Yum! I’ve been thinking about making some kind of holiday bark this year. This looks awesome! And now I have enough pumpkin spice recipes to last me for the next ten years… ha ha! This sounds so good! Candy is such a specific art form, so props to you for nailing this one. Thanks for joining in on the party! Thank you, Sara! Candy is super difficult, but I am so glad I tried it! Thanks again for hosting! Wow! 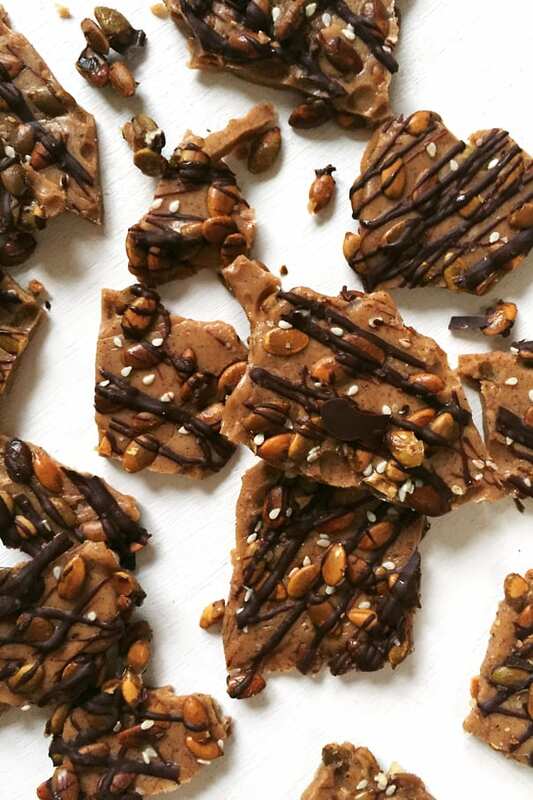 This dark chocolate pumpkin seed toffee bark recipe is incredible! I’m seriously so inspired right now. 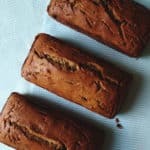 I need to add cinnamon to recipe and it would be perfect. Thx for sharing Susannah! Thanks so much, Jill! I bet cinnamon would be PERFECT in this. I hope you enjoy it! Gorgeous pictures. 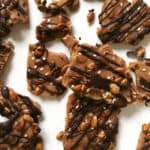 I made these dark chocolate pumpkin seed toffee barks for the super bowl party and it was a crowd favorite. I’m also gonna pin this post on my Pinterest board my followers will love it. Thanks for sharing, Susannah! 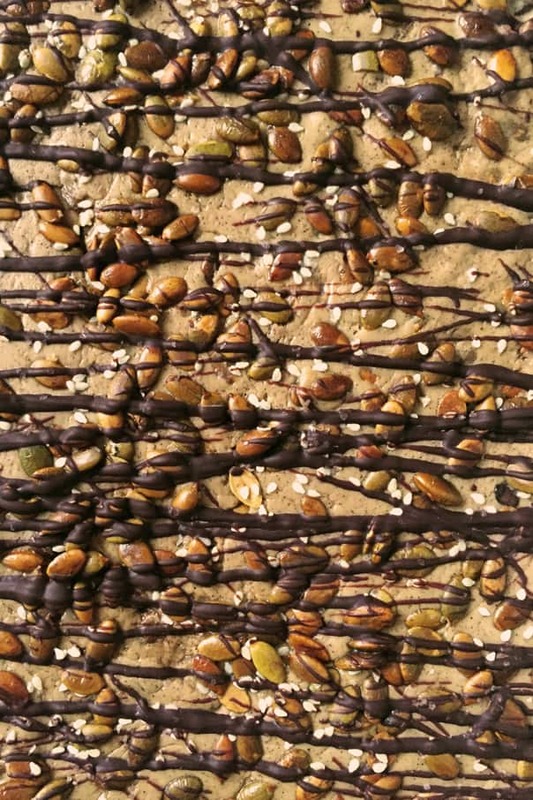 That dark chocolate pumpkin seed toffee barks looks absolutely fantastic. Beautiful photos, too. I look forward to trying this. Thank you so much, Kara! I hope you enjoy it! 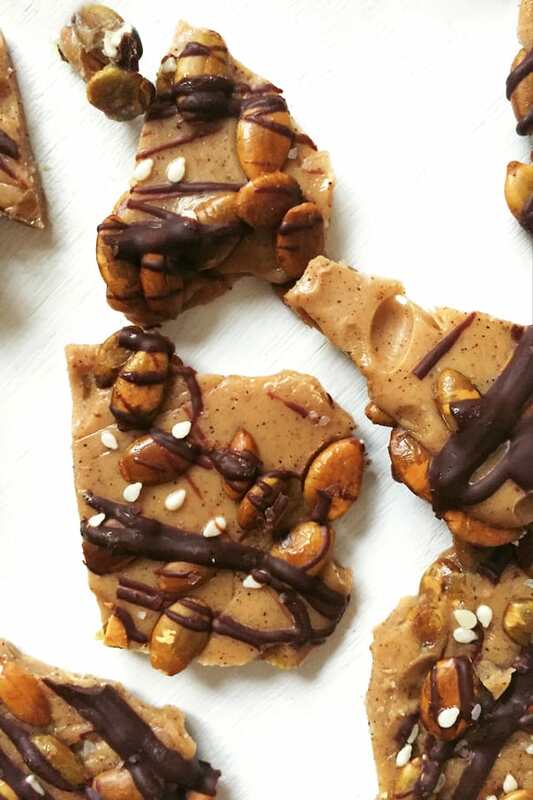 These dark chocolate pumpkin seed toffee bark are stunning. I’m not a talented baker, but I would love to give these a try!